DeMarcus Cousins took a shortcut to a potential NBA title. Despite all the advances statheads have made in how we measure NBA greatness, many fans still regard championship rings as the ultimate arbiter of a star player’s legacy. And although some scoff at such a simplistic measure, basketball is deterministic enough that the top players do generally tend to accumulate more than their share of championships. There are always anomalies — nobody thinks Robert Horry (seven rings) was better than Charles Barkley (zero) — but for the most part, ring-counting isn’t a total diversion along the path to understanding a legend’s place in the pantheon of the game. Sometimes it can even (gasp!) offer insight. The trouble is, the players began to realize how they were being judged. They saw how long a shadow Michael Jordan’s six titles cast over subsequent generations of would-be GOATs. They also saw what happened to Barkley’s and Karl Malone’s legacies after never winning a ring. “I don’t want to be 31 with bad knees and no championship,” LeBron James reportedly told friends before signing with the Miami Heat in the spectacle that was The Decision (Part 1) in 2010. He knew that, for all his individual accolades, history wouldn’t be kind if a player of his talent didn’t rack up titles. And in an era of players who increasingly control their own destinies, James took considerable steps to ensure a championship future. 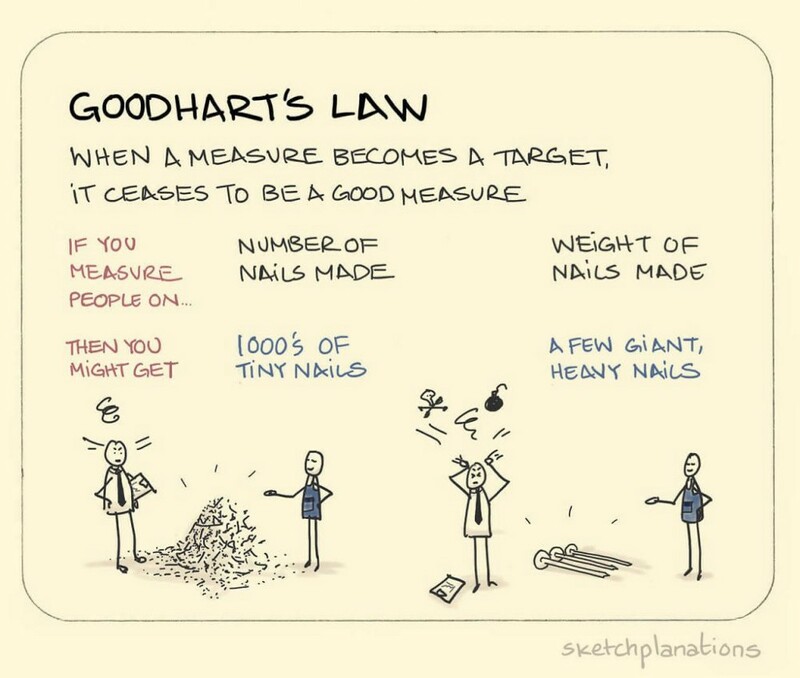 In economics, there’s an adage about what happens when people know they’re being evaluated on specific criteria; it’s called Goodhart’s Law. As professor Marilyn Strathern would phrase it: “When a measure becomes a target, it ceases to be a good measure.” In other words, when you focus on the measurements others are using to judge you, you start altering your behavior to optimize for those measurements — and the measurements begin to lose their meaning. When that happens, there are often unintended consequences. (Such as the famous parable of a Soviet nail factory responding to production targets by making thousands of tiny, useless nails.) And when it comes to ring-chasing, NBA stars have started to run seriously afoul of Goodhart’s Law. They’ve made championships the target — and, in the process, have fundamentally changed the meaning of those championships for a player’s legacy. * An average of the wins above replacement-scaled versions of three metrics for the three seasons prior to the player’s team change: Value Over Replacement Player (VORP), Win Shares (WS) and Estimated Wins Added (EWA). Age is as of the offseason in which the player changed teams. But winning is fun, and lifting trophies is even more fun. And it’s possible that, once the moment for heated online debate has passed, all that’s left is the championship count on Basketball-Reference.com. Fans who witnessed the state of the league at the time may go through their own calculations, boosting the value of some rings and devaluing others, but every title counts the same there. And if that sounds offensive, maybe that means it’s time for measures other than rings to gain weight when assessing the careers of the game’s greatest stars. Yes, Cousins is coming back from a serious injury. But he’s also a superstar talent who was specifically brought in to boost Golden State’s chances of winning in the playoffs. As measured by a consensus of the following value metrics over their previous three seasons: Estimated Wins Added, Value Over Replacement Player and Win Shares, all scaled to wins above replacement and averaged together. The Player’s Association does share in this blame as well. The league proposed salary-cap “smoothing” to reduce the impact of a big spike in the summer of 2016, but the players’ union turned it down. Then again, years of tough negotiating left union head Michele Roberts rightfully skeptical that the offer wasn’t going to hurt her clients’ earning potential. As another unintended consequence, perhaps pre-/nonsuperteam rings (such as Wade’s first Heat title in 2006 or Dirk Nowitzki’s championship with Dallas in 2011) will gain more value in the grand scope of NBA history.